Jacinda Bourne and her two sisters supported themselves and to some extent their amiable but financially reckless Uncle Ernest, as partners in the Bourne Matrimonial Agency. To the outside world Uncle Ernest is the owner and manager of the agency, but dear Uncle Ernest is only the front behind which the three sisters operate. The world of High Society—or Low Society for that matter—will not trust three women to run a business. Regency London underestimates the Bourne sisters. To Jacinda and her sisters this means finding the right sort of person, and that demands complete honesty of the client hiring them. It was vital to find “the right sort,” and Jacinda doubts Crispin Montague, the fifth Duke of Rydstrom, has been honest when answering the agency’s questions. He is hiding something, and Jacinda is determined to find out what it is. Handsome, young, and a descendent of ancient lineage, he answers Jacinda’s question evasively. There will no bride found for the Duke, a rich one since Rydstrom is desperately in need of money, until Jacinda learns what secret he is concealing and whether he is the right sort. One thing Jacinda already knows: the Duke lied about his income. “In Jacinda’s opinion, a man who told one lie likely had dozens more stored away.” She and her sisters had learned that fact the hard way from their father, whose infidelities had broken their mother’s heart, and likely hastened her death. Determined to unmask the Duke, Jacinda, disguised as a maid with apron and feather duster, is standing in the Duke’s study at his London house before dawn. She is not certain what she is looking for, but surely she will find something in her search. What she does not count on is finding the Duke who catches her perusing his desk with felonious intent. The Duke unceremoniously throws her out, but not before Jacinda finds a letter between the pages of one of Duke’s ledgers. It is apparently from Mrs. Hemple, his housekeeper on his country estate, and mentions how much Sybil misses him and awaits for his return. Who is Sybil, and why did the Duke not mention her during his interview? Is she his mistress, in which case Rydstrom definitely is definitely not “the right sort” to be trusted with a bride. No matter how blue his blood, how high his standing in society, or how much finding him a bride will boost their agency’s reputation, the Bourne Matrimonial Society will not do business with Duke if his character proves unsavory. Jacinda decides the only way to discover Rydstrom’s secrets is to travel to his estate to investigate—in disguise—a plan her sisters are vehemently against. Promising she will hire a temporary maid as a chaperone, Jacinda journeys to beard Crispin Montague in his crumbling, aged home. As the poet says, the best laid plans often go awry, and so it proves with Jacinda. She is discovered washed upon the beach below the Duke’s Cliffside manor, a very unlikely mermaid with sore ribs and a large bump on her head. She has no luggage but the first volume of Emma by Miss Jane Austin, carefully wrapped against the elements. Jacinda has no idea why she carrying the book; Jacinda has a serious lack of other ideas, too. Jacinda has no memory of her name, her home in London, the Bourne Matrimonial Agency, or what she is doing soaking wet on the Duke’s beach. Jacinda’s name is found written inside the copy of Emma, but she has no memory of who this person named Jacinda may be. Most important to the Duke, she doesn’t know why she is on his beach. The Duke’s retainers, like Mr. Fellows, butler and very close to a father figure to Crispin, as well as the villagers, are certain that this beautiful but wet and bedraggled girl is the woman His Grace traveled to London to find. Crispin is appalled at this assumption, but seems unable to dislodge the notion from everyone on the estate. Told by the doctor that Jacinda is too physically fragile to be moved to the inn in the village, Crispin is forced to provide her a room. He does so in the ancient tower of the house, then warns Mrs. Hemple to keep Sybil in their own wing and away from Jacinda. Like Jacinda’s plans, Crispin’s also go awry. Jacinda meets Sybil, a child who is unable to talk, but draws pictures to communicate with others. The little girl becomes attached to Jacinda and the reverse is true, a situation that worries the Duke. He must keep Sybil’s real relationship with him a secret; otherwise, the child’s future might be in danger. What is also not in the Duke’s plans is his growing attraction to Jacinda. On her side, Jacinda doesn’t remember the Bourne Matrimonial Agency and its first and most unbreakable rule: never fall in love with a client. How to Forget a Duke is just what one expects from a Regency romance: light, amusing, frothy, with heroine and hero at cross-purposes. 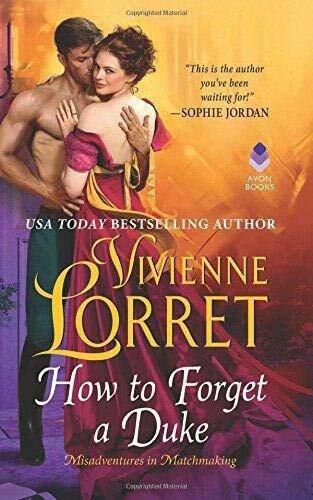 No one will be disappointed in Ms. Lorret’s latest offering.